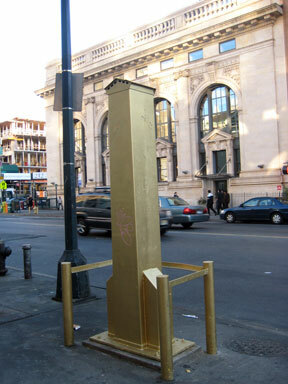 BROKEN, ABANDONED, and mundane objects along 14th Street … are painted a metallic gold color. that otherwise disappear into the urban periphery. also, check out: KENNY KOMER/BORIS RASIN !! 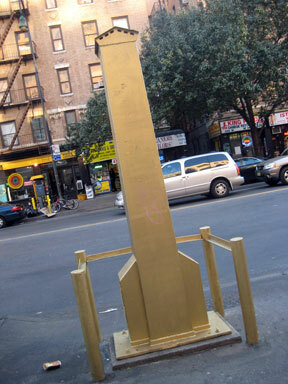 THIS SITE SPECIFIC PROJECT IS PART OF: ART IN ODD PLACES 2008 !!
. . . actually happened to walk by, what must be !! – one of their pieces !! 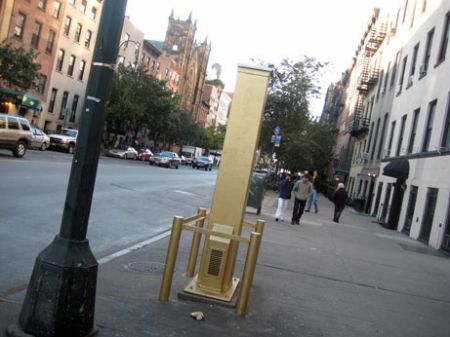 14th STREET – ARE PAINTED A METALLIC GOLD. “To be honest we are not 100% sure what that is. We believe it to be some sort of old vent, probably for the subway system. There are a bunch of them throughout the city and they usually appear above a subway line. So that is our guess. 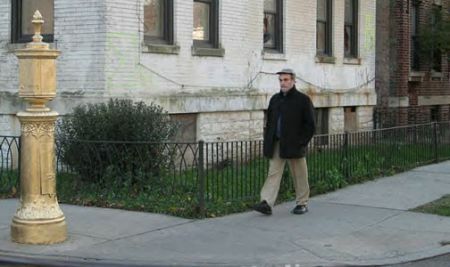 “We approached the DOT, FDNY and DEP to get permits to do a bunch of projects along 14th Street including parking meters, old fire call boxes, street poles, etc. While they all thought the project was interesting, none of them wanted to grant us official permission. Those vents you saw actually weren’t owned by DEP. Maybe they are owned by the MTA but we didn’t want to get another “NO” – so we just went ahead and painted them. We did it in broad daylight with rollers and were never stopped by a single cop, just curious pedestrians. see more pix of their project – on the artists’ website, pretty i-n-t-e-r-e-s-t-i-n-g !! and, definite – check out their: website !! KENNY KOMER & BORIS RASIN, are local talent – NYC kids – who seem to pretty much collaborate as a creative team – since way back in the day – when they became friends in their COOPER UNION undergrad college days. Though, interestingly enough they both went to the same Junior High School – MARK TWAIN JHS in CONEY ISLAND – and, they both had attended LAGUARDIA HS, previously. They made waves in the underground (pun intended !!) 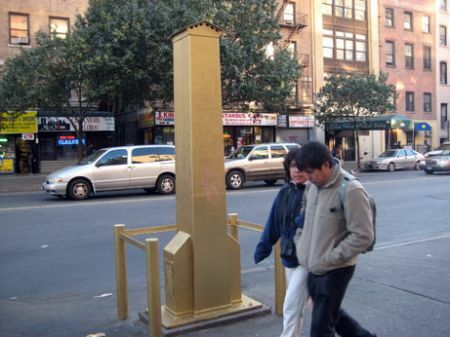 – way back in 2005 – when they created a series of very detailed site specific underground scenarios in the concrete crawlspace – beneath the WEST 26th ST. sidewalk – in Chelsea – for the now defunct CAPSULE GALLERY – while they were still undergrads at COOPER UNION. Kenny was in his Junior year, and Boris was a Senior. What was so unique, among many things actually – about this project – was that the installation was viewable though a ‘window’ in the basement location of the gallery, though the actual crawlspace itself – was only accessible through a kind of narrow ‘manhole’ entry in the sidewalk itself. see: 2005-09-26/SUB:URBAN-JET FAN’S ROOM ! !